Home beauty beauty tips body face fatter look mistakes older useful 7 Style Mistakes That Make You Look Older And Fatter! so that you can choose properly and look tip-top at all times. Otherwise, you may wear the wrong dress or the wrong hair color, and eventually end up looking older and fatter. If you are interested in learning how to dress to impress, keep reading. This article covers the 7 most common style mistakes women make that make them look older and fatter. The black color is associated with elegance, but as you get older this color doesn’t do the trick anymore. Namely, the hair stars graying and the skin whitens, so wearing black creates a strong contrast, emphasizing the flaws such as dark spots, blemishes, and wrinkles. The same applies for hair color as well. Avoid dying your hair black, but opt for warm shade of brown instead. This trick will make you look up to 5 years younger. Of course this doesn’t mean that you should never wear black, but it is recommended to combine it with something colorful, such as scarf of piece of jewelry. Wearing oversized clothes only makes you look bigger, which is something you want to avoid. Make sure you always buy the right size of clothes when you go shopping, instead of buying bigger size to hide behind it. 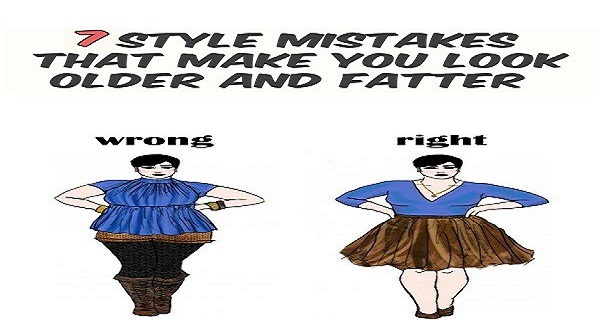 Find the style which fits your body shape the best and stick to it. Just because you are getting older, it doesn’t mean that you should stop wearing short skirts. Don’t wear too long skirts and hide your legs behind the skirt. Opt for a knee-length or above the knee and you will see it for yourself that these skirts fit your best. You need to choose your glasses with caution, as you need to find the frame which fits your face shape. Instead of buying the cheapest or the first ones you see, glance through the magazines and look for the type that fits your face best. Remember that you will wear them for longer, so it doesn’t really matter if they are pricey. Choosing the right partner when you go shopping is of utmost importance. You need a person who has a good taste and is ready to tell you the truth. As much popular platforms are, it doesn’t mean that they look good on everyone. For instance, if you have swollen feet or you are an elderly woman, these shoes will make your feet chubbier. Even though wearing a silk scarf is believed to be a nice accessory, you are not a flight attendant or in the 60s when they were all the rage. It is recommended to tie it around the bag handle instead of tying it around the neck, as it looks much nicer. You can also spice it up with nice necklace or some brooch.